US and Canadian UN COP16 observers and climate justice activists will demonstrate against their governments’ position at the climate change conference by joining the Via Campesina and Espacio Mexicano marches and sit-ins throughout Cancun today, then gather at the Cancun Messe this afternoon at 4pm to deliver a specific message to US & Canadian delegates. They will join thousands of protestors expected to march through Cancún today as part of the Global Day of Action for Climate Justice. 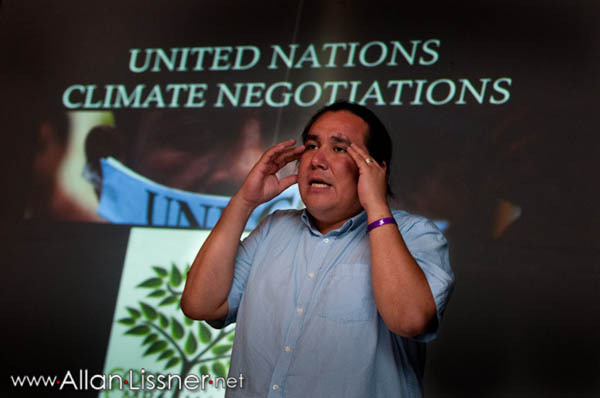 Although the UN negotiations have been kept highly secret, even excluding the majority of credentialed observers, it has become clear that a few powerful countries are manipulating the negotiation process to undermine the second period of the Kyoto Treaty, and deny the hard-fought additions from the Cochabamba Accord that have been integrated into the UN text over the last six months of intense global negotiations on climate change. Across the planet, people demonstrating for the Global Day of Action for Climate Justice call on governments to oppose the highly controversial REDD, which would ignore the rights of indigenous people who live in forests and does not distinguish between natural forests and reforestation projects. In fact, the only language specifying indigenous human rights has been removed from the draft text. In addition, protestors demand a World Climate Justice Tribunal and restrictions on carbon emissions that would limit global warming to 1%, considered to be the minimum necessary to prevent a recipe for death for small island states and coastal communities. Resulting climate migrants deserve recognition, rights and compensation. The US & Canadian protesters in Cancún stand behind the Cochabamba Agreement, produced by 140,000 people from 150 countries who gathered in Bolivia for the World People’s Conference on Climate Change and the Rights of Mother Earth in April, 2010 after the UN conference change negotiations in Copenhagen failed to produce a binding agreement. Bolivia has entered the negotiations in Cancun with the Cochabamba Agreement as its platform, and is recognized for defending the rights of people across the planet, many of whom feel unrepresented by their own government’s negotiators. US and Canadian protesters specifically denounce their governments’ anti-democratic behavior at the negotiations, and call for a strong second period commitment to Kyoto, and the inclusion of the Cochabamba Agreement in the Cancún text.